Great acoustics and beautiful art to view in this fine marble & glass lobby. 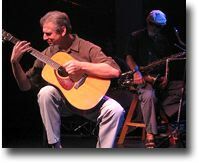 The atmospheric guitar work of Michael Tanenbaum and the samurai soprano sax of Randy Wheeler fill the space in a sublime way as they weave intricate melodies and harmonies. This extraordinary body of work documenting Papah naumoku kea Marine National Monument, (the Northwestern Hawaiian Islands) is the result of Hawaii photographer Levin's residency with the National Oceanic and Atmospheric Administration (NOAA). During his month-long stay, Levin took 3000 images of this remote archipelago from above and below the ocean's surface. This exhibition will feature 40 images in color and black and white providing viewers with a rare glimpse of this remote and little-seen world. A catalogue will be published in conjunction with this exhibition and will be available in the Museum Shop. This exhibition is presented in partnership with NOAA's Office of National Marine Sanctuaries. Join exhibiting artists Jacqueline Rush Lee and Madeleine Söder as they talk about their work in the current exhibition at 7:30 p.m.
For more information about The Contemporary Museum at First Hawaiian Center or the Morinoue family exhibitions, visit our website at www.tcmhi.org; Exhibition Info: (808) 526-0232; Reception: (808) 526-1322. Third Thursdays are free docent-guided tour days at FHC, when exhibitions are on view! Meet the docent in the bank lobby at noon. In 1996, The Contemporary Museum opened a downtown venue at the First Hawaiian Center in the heart of Honolulu's busy central business district, which was hailed as "a unique marriage of commerce and the arts." Generously underwritten by First Hawaiian Bank, these galleries co-exist with banking offices and showcase art by current and former residents and artists of Hawaii. The main banking hall is flanked by a dramatic art-glass wall created by James Carpenter. The wall consists of 185 prisms. The gallery area has a light and airy 60-foot vaulted atrium. Galleries are also located on the second floor mezzanine of First Hawaiian Center. First Hawaiian Center is the tallest building in Hawaii and the world corporate headquarters of First Hawaiian Bank, Hawaii oldest bank and a multi-billion dollar company established by Charles Reed Bishop, consort of Princess Bernice Pauahi Bishop and founder of Bishop Museum. The building cost over $175 million to construct and was designed by Kohn Pedersen Fox Associates who also built Sotheby's Worldwide Headquarters, the World Bank Headquarters, and the Shanghai World Financial Center. Walter Dods spearheaded the project and is credited with the idea to include the art gallery in the bank's public spaces. He is also credited with transforming First Hawaiian into the largest and most profitable bank in the state. The architects made considerable efforts to incorporate as much natural light into the building interiors and used metaphoric designs in reference to natural phenomena found in Hawaii. All of the profits of the art sales from FHC exhibitions benefit the artists. TCM at First Hawaiian Center is located at 999 Bishop Street in downtown Honolulu, Hawaii. Admission is free; Validated parking available for TCM Members with membership card. Monday-Thursday; 8:30 a.m. to 4 p.m. Guided tours are offered at noon on the third Thursday of each month, when exhibitions are on view. Completely underwritten by First Hawaiian Bank, the venue provides a convenient downtown location to view art by resident artists, former residents of Hawaii, or artists who have created a body of work in the Islands. New Exhibit starting 11/5/2010! 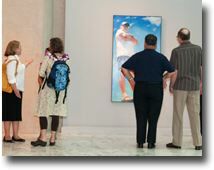 Hawaii's only museum dedicated exclusively to contemporary art--the art of our day and our time.